Sun, Jul 8, 2018, 09:42 am SL Time, ColomboPage News Desk, Sri Lanka. July 08, Colombo: Sri Lanka Navy, in accordance with naval traditions, ceremonially welcomed an Indian naval ship and a Maldivian Coast Guard ship arrived at the Port of Colombo on Saturday. 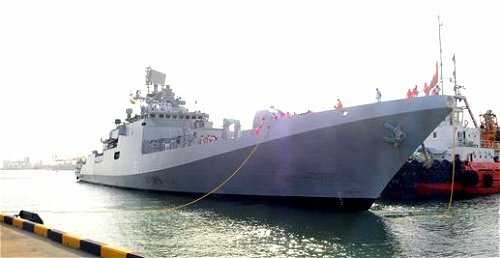 Indian Naval Ship INS Trikand, a Teg class Guided Missile frigate, arrived at the port of Colombo on 7th July on a goodwill visit. The Commanding Officer of the ship, Captain Upal Kundu called on the Commander Western Naval Area, Rear Admiral Nishantha Ulugetenne at the Western Naval Command Headquarters and held discussions on matters of mutual interest, the Navy said. During its three-day tour in Sri Lanka, the ship's crew is scheduled to participate in a friendly football match organized by the Sri Lanka Navy. INS Trikand will leave for the next port of call on 09th July. Meanwhile, Maldivian Coast Guard ship Huravee also arrived at the port of Colombo on a goodwill visit Saturday. The Commanding Officer of MCGS Huravee Major Mohomed Jamshad and the Defense Attachß of the Embassy of Maldives in Sri Lanka, Colonel Ahamed Ghiyas called on the Commander Western Naval Area, Rear Admiral Nishantha Ulugetenne at the Western Naval Command Headquarters and held cordial discussions. The MCGS Huravee is expected to depart the Colombo harbor on Monday (09) after its 3 day official tour of Sri Lanka.